The spirit is purified with activated carbon to remove fusel oils and bad odours. Do not be mean with purifying. It is better to make product of quality, which is much more fun to offer your guests than bad home-distilled spirit. You can purify so well that the product is equal to the finest vodka. Purification with activated carbon is done by pouring the spirit through a tube filled with the activated carbon. The spirit which runs out at the bottom is pure; it really is as simple as that. Thanks to the fact that the quality of the spirit is already good from the beginning very little carbon filtration is required. Use activated carbon of good quality! There is a big difference between various brands. Buy the best at www.partyman.se Carbon with a granule size of 0.4 mm – 0.85 mm is generally better that 0.4 – 1.2 mm. 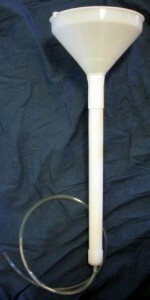 The best method of purifying is to use a water purifier as found in home-brew shops. This comprises a 1.5 metre long tube with a 10-litre container at the top. The tube is filled with activated carbon and after pouring spirit in the top 10-litre container the alcohol runs slowly through the carbon. The picture to the right shows a half meter tube that is sufficient if you choose high quality carbon and rinse it with water. All carbon brands are poorly washed at the factory, so pour 3-5 litres of hot water through the activated carbon before you purify the spirit so as to wash out the salts not wanted in the spirit. Also the cleaning function of the carbon is enhanced if it is wet. Wait an hour or preferably 24 hours after washing and then wash again with 2 litres of hot water. Then you only have to pour the spirit in the top. Discard the water that comes out first. Purify slowly! If you give the carbon plenty of time it will purify better. Constrict the tube from the container so the spirit runs slowly. Read the activated carbon book that can be downloaded from www.partyman.se The book describes different types of carbon and methods for enhancing purification.